A dip that everyone can agree on! I mean who doesn't like pizza? Just make sure to save some for the kids. 1. In a medium bowl, combine softened cream cheese, half of the Parmesan cheese, Italian seasoning and garlic powder. Mix together until smooth. 2. Grease a 9” pie plate and spread mixture evenly into the bottom. 3. Top the cream cheese mixture with half of the of the Mozzarella cheese. 4. Spoon pizza sauce evenly over the top and spread. 5. 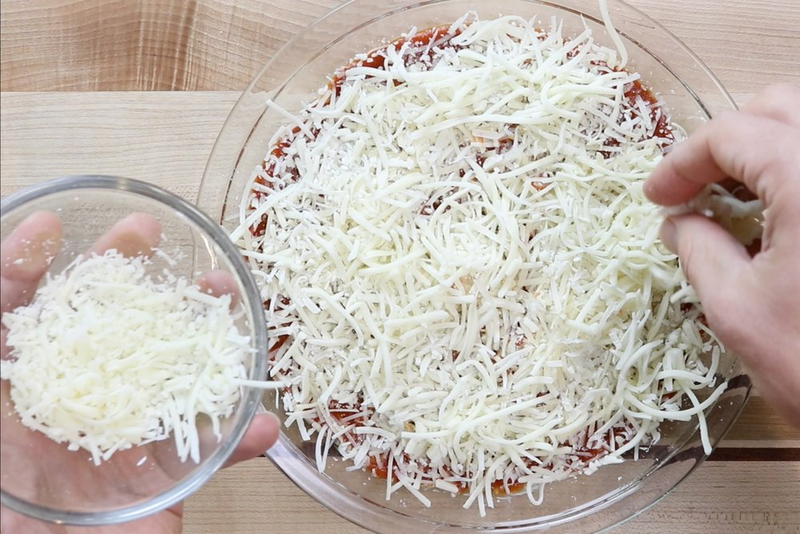 Sprinkle the remaining Parmesan cheese over the sauce followed by the rest of the Mozzarella. 6. Top with green bell peppers, pepperonis and jalapeños. Sprinkle the crushed red pepper flakes over the top. 7. Bake for 15-18 minutes at 350 degrees. 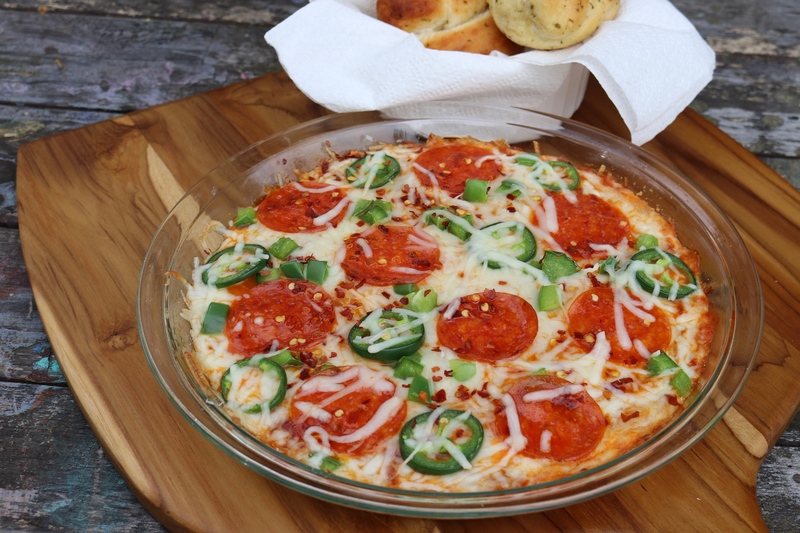 Sprinkle mozzarella cheese over pizza dip after baking for presentation. In a medium bowl, combine softened cream cheese, half of the Parmesan cheese, Italian seasoning and garlic powder. Mix together until smooth. Grease a 9” pie plate and spread mixture evenly into the bottom. Top the cream cheese mixture with half of the of the Mozzarella cheese. Spoon pizza sauce evenly over the top and spread. 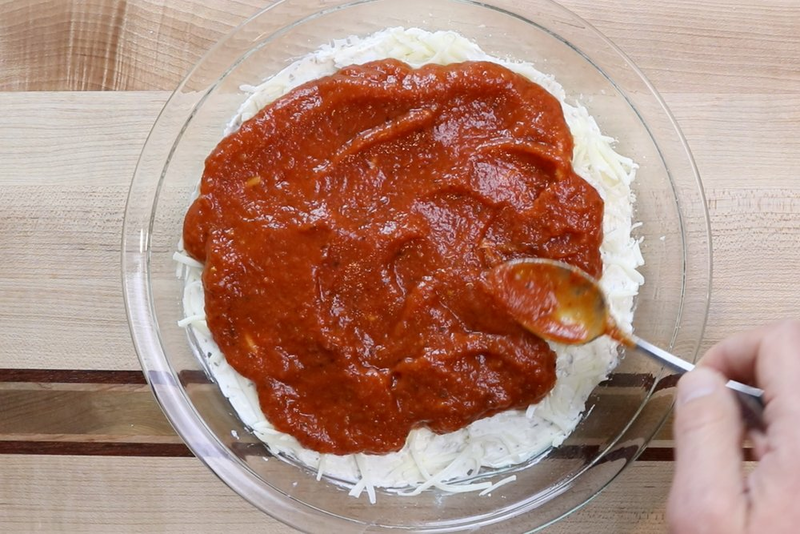 Sprinkle the remaining Parmesan cheese over the sauce followed by the rest of the mozzarella. Top with green bell peppers, pepperonis and jalapeños. Sprinkle the crushed red pepper flakes over the top. Bake for 15-18 minutes at 350 degrees. Sprinkle mozzarella cheese over pizza dip after baking for presentation. *If the spice is too hot feel free to leave the jalapeños and red pepper flakes off. Add your own toppings to customize!